Whenever I broil I always keep the oven door ajar, so that I can keep an eye on the steak. Just make sure you have your fan running, otherwise you might be listening to a smoke alarm. The marinade will give you a nice crust when you broil it, and you should, when cooked properly, have a nice tender, pink center. You can also use a flat iron steak in this recipe if you wish. 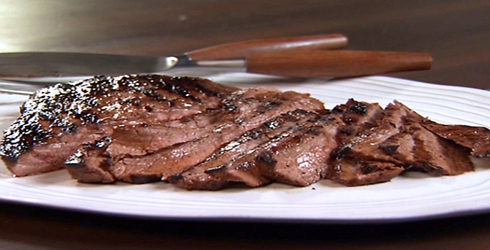 Scoring the steak will help the marinade penetrate the meat and keep it tender and flavorful. Don’t try and cut down on the overnight marinade, this is a very important step that makes this recipe so delicious. Combine soy sauce and next 6 ingredients in a shallow dish. Score steak on both sides, and place steak in marinade. Cover and refrigerate overnight, turning occasionally. Preheat broiler. Remove steak from marinade, discarding marinade. Broil steaks 5 to 7 minutes on each side or to desired degree of doneness. To serve, slice thinly across grain. This looks so good, I could smell it when I saw the picture! Definitely going on my list to make next week. Thanks for all the great recipes!